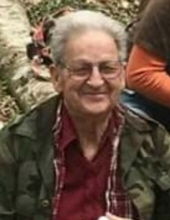 Melvin Grigsby, age 80, of Maryville, TN formerly of Lotts Creek, KY passed away on Monday March 25, 2019 at Hazard ARH. He was a United States Air Force Veteran and a retired electrician for the Department of Energy- Oakridge National Labs in TN for 25 years. Melvin was an outdoorsman who enjoyed fishing & hiking, an avid book reader, but loved his children and grandchildren most of all. He was born on Jan. 18, 1939 to the late Pearl Grigsby and the late Ethel Grigsby. He is also preceded in death by his brothers and sisters: Vickie, DeVaughn, Pearl & Mitchell. Psalm 121: I will lift up mine eyes unto the hills, from whence cometh my help. To send flowers or a remembrance gift to the family of Melvin Grigsby, please visit our Tribute Store. "Email Address" would like to share the life celebration of Melvin Grigsby. Click on the "link" to go to share a favorite memory or leave a condolence message for the family.